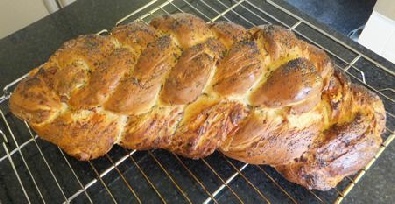 A REALLY DELICIOUS LOAF FULL OF WONDERFUL FLAVOURS! I have used an electric mixer to make this loaf but you can make it using a large bowl and mixing by hand. You will need to knead the dough for longer as with the mixer the dough hook does half the work! 1. Using a paddle in the mixer combine 285 gms of flour with the salt, sugar and turmeric. 2. Add the yeast keeping well away from the salt. If using fresh gently rub in with a little flour, if using dried just add. 3. Add the 250mls of tepid milk, the 70 gms of melted butter and 3 Eggs (beaten) plus 1 yolk. 4. Add the rest of the flour (340 gms) and mix with the dough hook until well mixed and leaving sides of bowl. The dough will be fairly sticky. 5. Tip onto a very lightly floured board and knead until smooth and silky. 6. Put in a lightly greased bowl and prove for 1½ hours or until double in size. 7. Whilst the dough is proving, crispy fry the bacon and cut into small pieces, fry the chopped red onion in a little oil until soft but not brown, grate the cheese and chop the basil. 8. After proving tip dough out on to a lightly floured surface and divide three equal pieces. 9. Combine 2 of the pieces so you have two thirds and one third. 10. Add the bacon and basil to the two thirds piece of dough and incorporate thoroughly. 11. Add the cheese and onion to the one third and incorporate thoroughly. 12. Cut the bacon and basil dough into 3 and roll into evenly shaped sausage shapes about 12 to 14 inches in length and plait together making sure the ends are folded over and sealed. Place on your baking tray. 13. Plait the smaller piece in the same way but making your 'sausage' shapes about 6 - 8 inches long. 14. Brush the middle of the larger loaf with egg wash (using your remaining egg) and place the smaller one on the top. 15. Prove until double in size, about 1 hour. 16. Brush with beaten egg and sprinkle with poppy seeds. 17. Cook for 25 mins at 200°C Fan. the loaf should sound hollow when tapped on the bottom. 18. Cool on a wire rack and serve with lashings of cold butter!